Deck The Halls Video Slot Guide & Review - Casino Answers! Deck the Halls is a 5-reel, 30-line video slot developed by Microgaming, featuring a wild symbol, stacked wilds, scatter wins, multipliers and a free spins feature. You can play the Deck the Halls video slot at Bovada. Coin sizes on the Deck the Halls slot machine are $0.01, $0.02 and $0.05. You can select from 1-30 paylines and 1-10 coins per line on the Deck the Halls slot game. Deck the Halls is a penny slot, so you can bet anywhere from a penny per spin up to the maximum total bet of $15 per line. Deck the Halls has a betting range best suited for casual players. 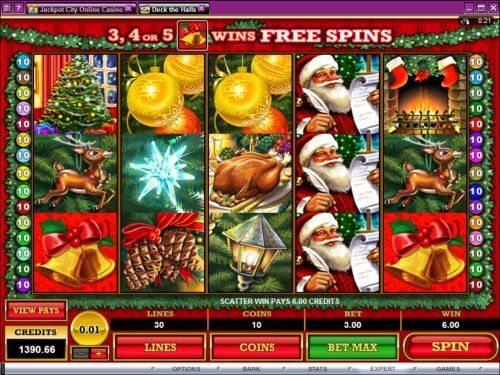 To play the Deck the Halls video slot, select your bet and press the “Spin” button. To play all 30 lines at 10 coins per line, you can use the “Bet Max” button to spin the reels. The highest paying symbol on the Deck the Halls online slot game is the Deck the Halls symbol. When you hit 5 of these symbols on an active payline, you will win the 4000 coin top jackpot. The Deck the Halls symbol is wild and will substitute for all symbols except for the scatter symbol. When substituting in a winning combination, the Deck the Halls symbol will double your winnings. The Santa Claus sybmbol is the second highest paying symbol; paying up to 1000 coins. The Santa Claus symbol is stacked at all times. The Bells symbol is the scatter symbol on Deck the Halls. You can win up to 100X your total bet with 5 Scattered Bells symbols on the reels of Deck the Halls. 3 or more Scattered Bells anywhere on the reels will win 10 free spins with a 2X multiplier. The Deck the Halls symbol is a stacked wild and the symbol will act as a 4X multiplier during the free spins feature. The free spins feature can be re-triggered. You can win up to 2,400,000 coins from the Deck the Halls free spins feature at Bovada. To use the autoplay mode on the Deck the Halls online slot machine, you must hit the “Expert” button. You can now play 5 or 10 autoplay spins. For advanced settings, hit the “AutoPlay” button and you can now play 5, 10, 25, 50, 100, 250 or 500 autoplay spins and stop autoplay if a win exceeds or equals $100, $500, $1000, $5000 or $999. Autoplay will stop on any feature contained in the game. You can stop autoplay at any time. For those in the holiday spirit, Deck the Halls is a fine choice for a Christmas slot. There’s nothing that sticks out and grabs you about it, but there’s nothing wrong with it either. It does have a free spins feature and some chances to win some Christmas loot, but it doesn’t have a bonus game or anything beyond average presentation. To play the Deck the Halls video slot for real money, sign up and make a deposit at Bovada! Can American players play the Deck the Halls video slot for real money? No, USA-based players cannot play Deck the Halls for real money. For a bunch of USA-friendly X-Mas slots such as Santa Strikes Back, please check out Bovada. Where can I play a no download instant play version of the Deck the Halls slot? You can find a free Deck the Halls Flash game at Bovada. You can play for real money or for free. If you have difficulties with the Instant Play Flash software, make sure you have the latest version of Adobe Flash Player.